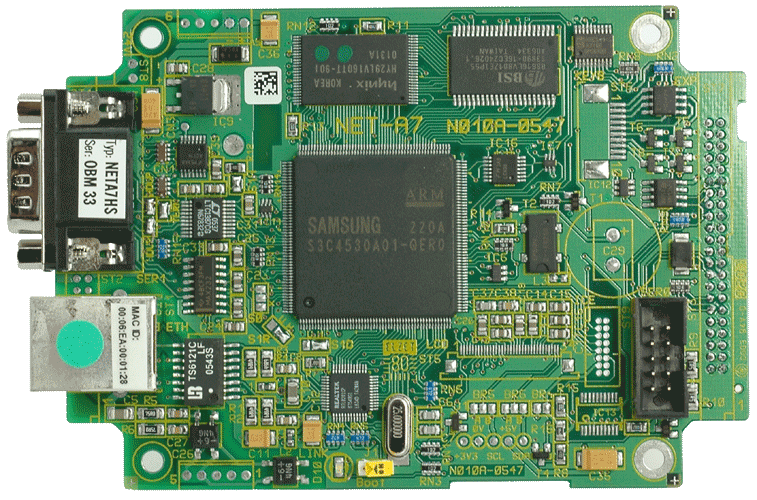 The NET-A7 embedded module of the ethernode®boxes is also available as OEM module. A lead-through processorbus enables direct controlling of I/O or a processor-interlinking via FIFO etc. Optionally with RJ45/Sub-D9 or for external connecting plugs. 5V supply with 3,3V regulator "on board"
A 125x85 mm processormodule with a ARM7 32-Bit-CPU for sufficient processing power, buffered static RAM with 1MByte and 2Mbyte Flash. Also includes a big configuration-EEPROM, a realtime clock (e.g. running without Ethernet) and a matrix-keyboard-decoder. 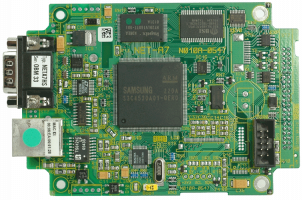 Two serial interfaces with RS232 drivers – one can be switched to RS485 – serve the local communication with measuring module, cardreader, printer, radio modul or whatever can be attached serial. The 44 pole 2mm-expansionbus for your special periphery offers D0..D7, A0..A9, 2 Chip-Selects, 3 Interrupts, 4 direct Processor Inputs, TxD and RxD of serial Interace 0, RESET, I²C and 5V. It allows for as many digital Inputs as you want, analog-/digitalconverters, radio modules, FIFO storages to attach on an existing controller etc. It is also possible to get a 44 pole plug instead of Ethernet socket and the 9 pole plug. The software is very flexible beccause of our own realtime kernel with support of parallel tasks and userwritten interrupts driver. SerDrv offers telegram oriented treatment for serial interfaces, the BgMEM-Modul datalogger - functionality with FIFO or ringpuffer – access, the mSP Server-Pages is the connector between the webserver and your C-Task. Don’t hesitate to ask us, we are glad to help with configuration and also for customer specific development.